2 stood why I didn't pick-up a girl while I was in Nashville. A group of cadets got leave the other night and went to Nashville. A friend of mine, Bennet Moyle, who is married, and I, who considers himself all but married, went together. We took a ribbing because all we did was have a good meal and see the show "Bambi." 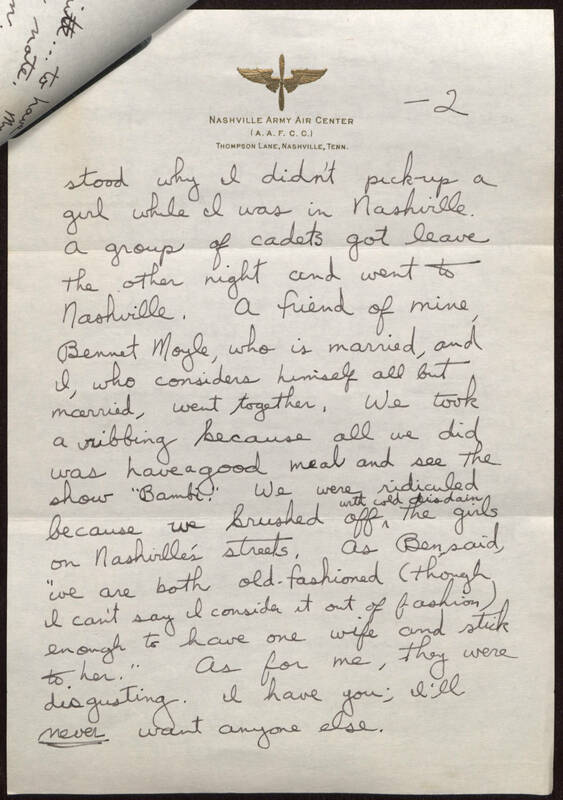 We were ridiculed because we brushed off with cold disdain the girls on Nashville's streets. As Ben said, "we are both old-fashioned (though I can't say I consider it out of fashion) enough to have one wife and stick to her." As for me, they were disgusting. I have you; I'll never want anyone else.